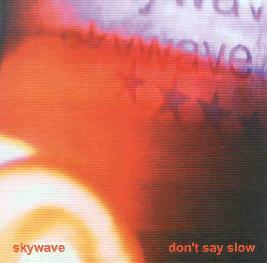 Skywave - "Don't Say Slow"
Skywave are a three piece band from Virginia that plays some very spaced out yet melodic music. I am not quite sure how they got the sound on their CD but it is quite a special raw production sound. The vocals are quite far back in the mix and sound like they are in a echoe chamber. The guitars sometimes come in clean but mostly distorted and fuzzed out. A little Sonic Youth, a little my Bloody Valentine and a little Skywave. Quite a decent 4 track EP. For more information you can visit Skywave at: http://www.killerrockandroll.com. Contact via snail mail c/o Skywave; 204 Anderson Dr; Fredericksburg, VA 22405.